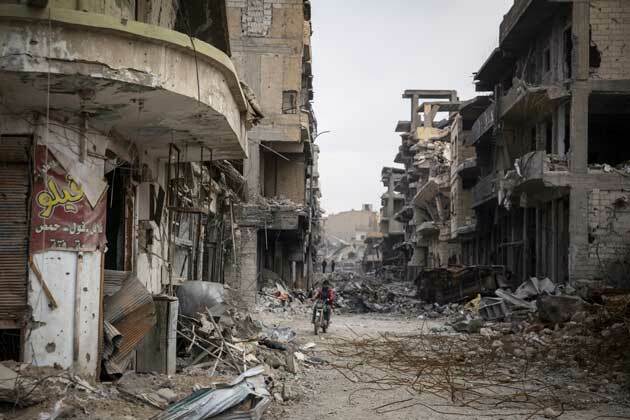 RAQQA, Syria, Jun 5 2018 (IPS) - Driving around in Raqqa, it was easy to believe what a senior US military official said – that more artillery shells were launched into the Syrian city than anywhere else since the Viet Nam war. There was destruction to be seen on virtually every street, in the heaps of rubble, bombed-out buildings and twisted metal carcasses of cars. There were also constant reminders of devastated civilian lives, in the broken possessions, scraps of clothing and grubby children’s toys scattered amongst the ruins. Between 6 June and 17 October 2017, the US-led Coalition mounted an operation to “liberate” Raqqa from the armed group calling itself the Islamic State (IS). The Coalition claimed its precision air campaign allowed it to oust IS from Raqqa while causing very few civilian casualties, but our investigations have exposed gaping holes in this narrative. Our new report, ‘War of annihilation’: Devastating Toll on Civilians, Raqqa – Syria, presents the evidence we collected over several weeks in Raqqa, investigating cases of civilians who paid the brutal price for what US Defence Secretary James Mattis promised to be a “war of annihilation” against IS. Residents were trapped as fighting raged in Raqqa’s streets between IS militants and Kurdish-led Syrian Democratic Forces (SDF) fighters, supported by the Coalition’s air and artillery strikes. IS mined escape routes and shot at civilians trying to flee. Hundreds of civilians were killed: some in their homes; some in the very places where they had sought refuge; and others as they tried to flee. We investigated the cases of four Syrian families, who between them lost 90 relatives and neighbours almost all of them killed by Coalition air strikes. In the case of the Badran family, 39 family members were killed in four separate Coalition air strikes as they ran from place to place inside the city, desperately seeking a way of avoiding rapidly shifting frontlines and coalition air bombardments over the course of several weeks. “We thought the forces who came to evict Daesh [IS] would know their business and would target Daesh and leave the civilians alone. We were naïve. By the time we had realised how dangerous it had become everywhere, it was too late; we were trapped,” Rasha Badran told us. After several attempts to flee, Rasha and her husband finally managed to escape, having lost their entire family, including their only child, a one-year-old girl named Tulip, whose tiny body they buried near a tree. The Aswads were a family of traders who had toiled hard all their lives to build a home in Raqqa. Some of them stayed behind to defend their home from being looted, sheltering in the basement. But, on 28 June, a Coalition air strike destroyed the building, killing eight civilians, most of them children. Another family member was killed when he stepped on an IS mine after returning to the city to try to recover the bodies days later. During the four-month offensive, US, British and French Coalition forces carried out tens of thousands of air strikes. US forces, which boasted about firing 30,000 artillery rounds during the campaign, were also responsible for more than 90% of the air strikes. The Coalition repeatedly used explosive weapons with wide-area effects in populated areas where they knew civilians were trapped. There is strong prima facie evidence that Coalition air and artillery strikes killed and injured thousands of civilians, including in disproportionate or indiscriminate attacks that violated international humanitarian law and are potential war crimes. Precision air strikes are only as precise as the information about the targets. In addition, when bombs big enough to flatten whole buildings are being used, as well as artillery with wide-area effects, any claims about minimizing civilian casualties ring hollow. 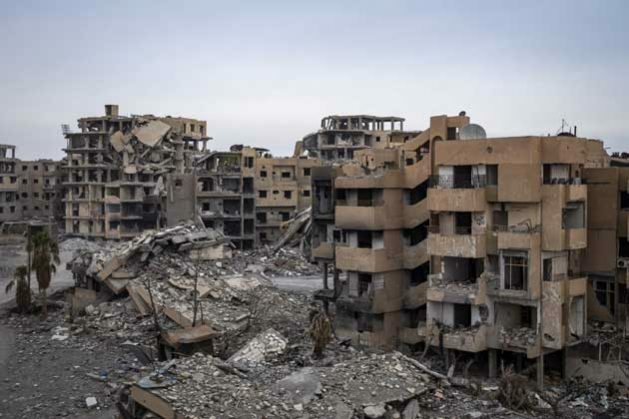 Amnesty International is urging Coalition members to investigate impartially and thoroughly allegations of violations and civilian casualties, and to acknowledge publicly the scale and gravity of the loss of civilian lives and destruction of civilian property in Raqqa. The USA, UK and France must disclose their findings. They must be transparent in disclosing their tactics, specific means and methods of attack, choice of targets, and precautions taken in planning and execution of attacks. They must also review the procedures by which they decide the credibility of civilian casualty allegations and they must ensure justice and reparation for victims of violations. The victims, including tiny one-year-old Tulip, deserve justice. Coalition members must not risk repeating the same mistakes elsewhere.